It’s also designed to improve your core strength and stability – which in turn will improve the mechanics of your golf swing. 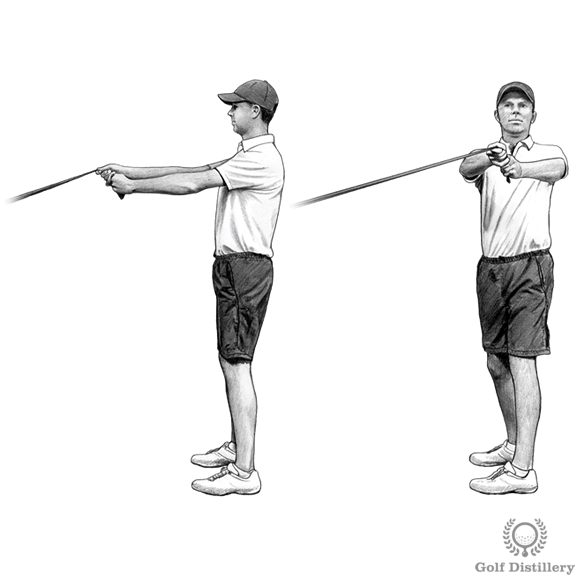 The result is that you’ll be able to swing the club with greater control and consistency, leading to better ball striking and lower scores. 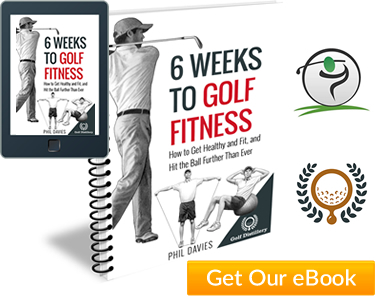 Sports Scientists have shown that golfers of all abilities and ages can measurably improve their game with a golf fitness program. They can reduce their risk of injury, hit longer drives and lower their overall scores. 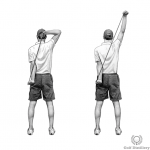 For a more detailed (but plain English) review of this research, please see this golf strength training article. 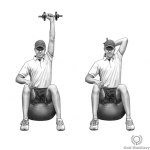 What Equipment Will You Need For This Golf Strength Workout? 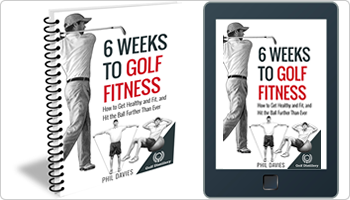 I’ve designed the golf strength workout below so that it can be performed easily from the comfort of your own home. You will require some basic equipment but it won’t take over the house. 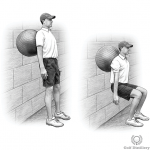 A stability ball (also called a Swiss or gym ball). 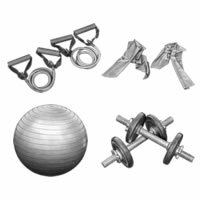 A set of adjustable dumbbells (the weights will depend on your fitness level). A resistance band(s) (different colours equate to different resistances). Most resistance band exercises have a dumbbell alternative and vice versa, so you can opt for either one or the other. Having both gives you the most options however. This can help to prevent injuries like muscles tears and strains. It also gradually raises your body temperature and blood pressure so you can ease into the routine.It’s important to warm up before any form of vigorous exercise. The best form of warm up is any activity, or series of activities, that gets the heart pumping and the body warm. 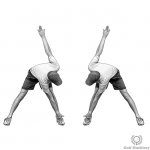 Total body movements likejogging/marching vigorously on the spot and star jumps are good warm up activities. Start gently and gradually increase the intensity over 5-10 minutes. 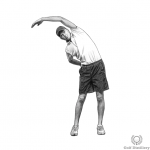 You may also want to complete some dynamic stretches – you’ll find examples in the golf warm up routine. You probably want to avoid static stretching during your warm up (when you hold a stretch in position for a period of time). 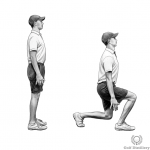 This type of stretching is best saved until the end of your golf strength workout, when your body is thoroughly warmed up. Complete this routine 2-3 x per week. Any more than 3 brings minimal if any extra returns. Leave at least a full day between sessions. For example, perform this routine on Mon/Wed/Fri or Tue/Thu/Sat. 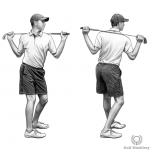 Avoid performing this routine on the day of a golf competition (before it anyway). The chart below recommends a certain number of repetitions for each exercise. Select a weight or resistance band that just about allows you to complete that number of reps.
That last 1-2 reps should be a struggle but you don’t have to push yourself to complete failure (where you can’t perform another single repetition). Once an exercise at a certain weight becomes too easy, increase the weight slightly. Don’t increase the weight on more than 3 exercises during any single session. Remember to BREATHE as you perform each strength exercise. It’s easy to forget, especially when you are holding certain positions (like a plank or static squat). Breath holding raises blood pressure considerably and can leave you feeling dizzy. Always consult your doctor before starting a new exercise programme and if you suffer from, or have suffered from in the past, any significant injuries or joint problems, please consult a qualified Physical Therapist first. If you consider yourself quite unfit, you may want to start with 1 set per exercise for the first few weeks. As the exercises become easier, add in an extra set rather than increasing the weight.